PHII's Online Defect Course is 12 hours and contains 10 lessons with hundreds of interactive flash cards that include Grounds, Exterior, Structure, Roofing, Attic, Basement, Plumbing, Electrical, Interior, and HVAC. Each flash card contains an actual photo of a defect and challenges you to explain what went wrong and what is the proper course of action to recommend to the client. Click to reveal the answer, then take a final exam at the end of the course. Review the photos over and over again! 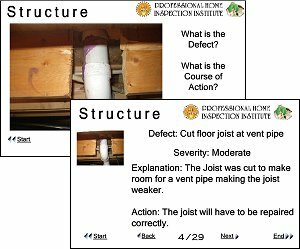 Learning home inspection requires time seeing and responding mentally to defects, and flashcards are a proven method of reinforcing learning and improving retention. Seeing an image with a question makes you stop and use your analytical skills, just as you did in school. The only difference is that the flashcards are online. We compiled these defect photos from a variety of distressed homes we've inspected across the country. You are almost certain to encounter some defects you haven't seen before or may wonder how to describe. This is an excellent entry course for all levels of home inspectors because it teaches defect recognition for beginners, but it can also challenge the seasoned inspector to determine exactly what is wrong and how to properly explain it to the client within the inspection's scope. As you complete each lesson, you will use interactive flash cards and take practice quizzes that will test your knowledge, generate instant feedback and provide opportunities to correct mistakes, re-learn information and re-test. Our system keeps track of your progress, so you can take a break at any time, even turn off your computer and the course will return to where you left off. When you finish the course you will possess the knowledge and skills needed to report on a variety of defects. The typical defects found in both new and older homes. Some unusual defects that are interesting to know. Detailed explanations for each defect encountered. The proper course of action for each defect encountered. 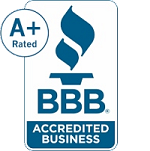 Package Includes: Online Course Access and optional back-up CD, Online Flashcards & Testing, Certificate of Completion, Toll Free Student Support.